I’m looking forward to discussing some of my research on death and modern queer culture at Birkbeck this May. The talk is free and open to all. You can book your place by emailing bebirkbeck@bbk.ac.uk. Further details below. This lecture is part of the Be Birkbeck lecture series. 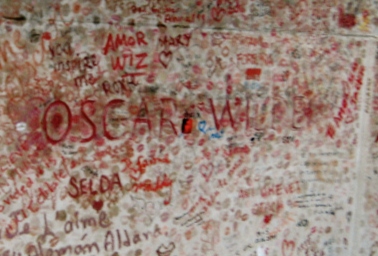 How did the death of Oscar Wilde impact on the women and men who identified with ‘the love that dare not speak its name’? This talk explores an archive of little known writings on homosexual death and suicide by the influential sexologist Magnus Hirschfeld (1868-1935). Hirschfeld is best known today for his sexual rights activism, foundational studies of transvestism and opening of the world’s first Institute of Sexual Sciences in Berlin. But he was also a chronicler of the effects of hate and violence against lesbians and homosexual men. His writings contain many accounts of homophobic attack from around the world including observations on the trial and death of Oscar Wilde. These accounts suggest that such attacks had a wide-ranging impact, affecting not ‘just’ the victim but also the women and men who identified in some way with her or him. The talk explores this unique record of queer life and death, 1900-1930. It demonstrates that violence, as well as affirmative cultural politics, shaped the emergence of modern sexual identity. The talk will also address the critical challenges of this archive: how to engage with the negative, and often violent, aspects of queer history without reinforcing pernicious stereotypes about miserable lesbian and gay existence? This event is free and open to all, but booking is essential. This entry was posted in Uncategorized and tagged Birkbeck, death, Magnus Hirschfeld, moderniity, Oscar Wilde, queer culture, queer history, suicide, talk on April 28, 2015 by Dr Heike Bauer. 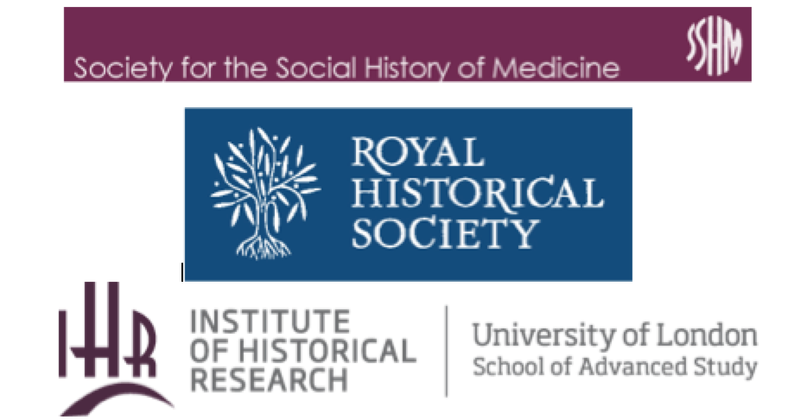 After the excellent Biological Discourses conference at Cambridge, I am now looking forward to The History of the Body symposium at the IHR. I’ll be speaking on ‘Suicidal Scarring: Discourse and Experience in Magnus Hirschfeld’s Body of Work’. In this paper, I will examine what Magnus Hirschfeld’s work can tell us about the complex role played by the body in the modern history of homosexuality. Specially, I will focus on his remarks about the ‘Suizidialnarben’ – or scars left by suicide attempts – which he encountered on the bodies of some of his patients. By exploring how the scarred bodies of these suicidal women and men shaped Hirschfeld’s work, the paper will address broader questions about the relationship between discourse and experience in the history of the body, and what a focus on the body might add to those examinations of the past that focus more specifically on sexuality. The full programme is included below..
Heike Bauer, ‘Suicidal Scarring: Discourse, Experience and Magnus Hirschfeld’s Body of Work’. Click here for my paper abstract. Plenary Talk 17:00-18:30 – Bedford Room, Senate House. This entry was posted in Uncategorized and tagged history of sexuality; history of the body; conference; Magnus Hirschfeld; suicide on April 15, 2015 by Dr Heike Bauer. 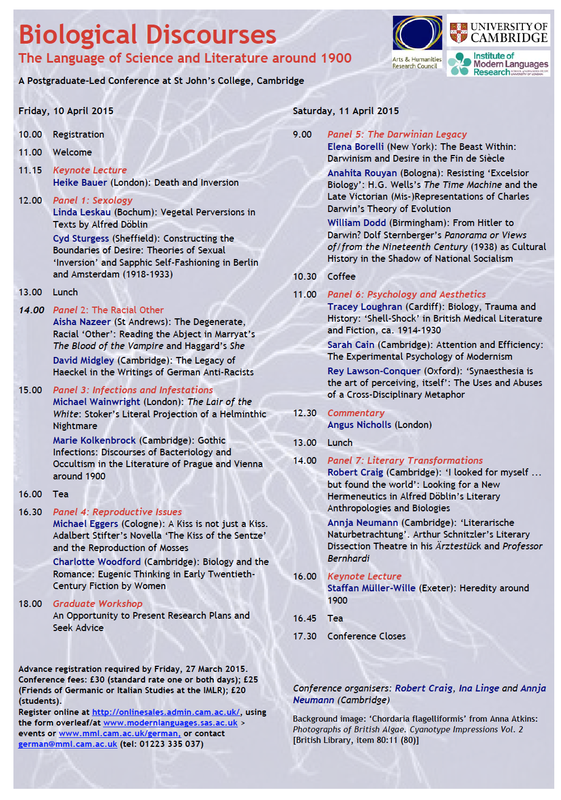 I’m delighted to have been invited to present the opening keynote at “Biological Discourses: The Language of Science and Literature around 1900”, which takes place at St John’s College, Cambridge, 10-11 April 2015. The programme looks fantastic. It can be downloaded as a poster here. Or take a look at it below. I’m looking forward to the next two days! Advance registration required by Friday, 27 March 2015. Conference fees: £30 (standard rate one or both days); £25 (Friends of Germanic or Italian Studies at the IMLR); £20 (students). This entry was posted in Uncategorized on April 9, 2015 by Dr Heike Bauer. This entry was posted in Uncategorized on April 7, 2015 by Dr Heike Bauer.